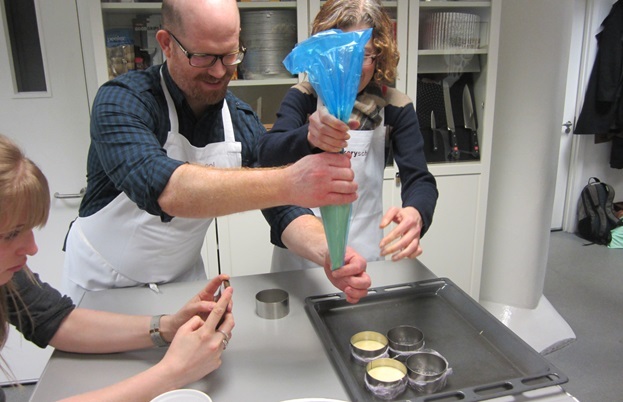 On 13th March we were delighted to host the first in a new series of cookery masterclasses. The idea is simple, it’s the chance for one of the many award-winning chefs from our website to give hands-on tuition to a lucky group of food bloggers and keen cooks. Our first event saw Graham Hornigold, Executive Pastry Chef of the Hakkasan Group work together with Daniel Pearse, Head Pastry Chef of Hakkasan London, and Juan Pablo Colubri, Pastry Sous Chef at Hakkasan Group to create four amazing desserts and pass on some unique hints and tips to the group. After a few drinks and nibbles it was on with the aprons to watch Graham make the first dessert of the night – Spiced Asian Mango. 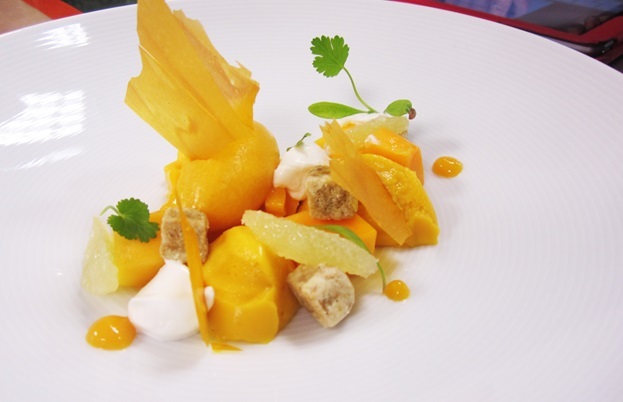 The kitchen was filled with the aroma of freshly cut mango, as Graham and his team explained some of the thought processes behind the dish and many served at the Michelin starred Yauatcha. The idea was to surprise the diner with textures and flavours not normally associated with mangoes, but ones that complement them perfectly. We saw that hints of chilli and coriander can work perfectly with this sweet fruit. Coriander croutons added bite and crunch to the layers of light mango mousse, icy mango sorbet and delicate mango crisps. Most of the kitchen had foam gun envy as Juan expertly showed how to top off the desserts with a swirl of mango mousse. Even if you don’t have the time or skill to plate as well as the chefs from Hakkasan, the gun means you can quickly add an attractive flourish to the desserts. Next up was Lemon and Sesame Tart and all of our cooks were able to make this dish under the watchful eye of Graham and his team. We saw some expert egg cracking in preparation for the Italian meringue and creamy lemon tart mix. The sesame sable dough for the tart base had to be rolled thinly between two sheets of baking paper to create the desired texture. Graham’s expert tip to avoid shrinkage, was to part cook the dough before cutting into shapes half way through baking. Once again Graham and his team showed two ways of plating up this dessert, and our guests picked up tips in expertly browning the mini meringues with a blow torch along the way. Another multi textured dessert was up next. Rhubarb crumble and custard took on an amazingly delicate and decadent look. The desserts were served with crème diplomat and a white chocolate filled with a liquid custard. Finally, Graham’s team had saved the best until last with an amazing display of the making of their signature Tarte Tatin. You might think there were no surprises to a Tarte Tatin. How can you give the classic French dish of caramelised apples and pastry a “wow factor”? Daniel Pearse revealed a gadget from Korea that looked a little like one of the vegetable spiralizers we see on Saturday Kitchen. However, rather than produce thin ribbons, he used the spiralizer to create a huge strip of apple “lasagne” from each single apple. Our bloggers couldn’t get enough of this and took to Twitter and Instagram immediately to express their delight. “Brilliant”, “I need this machine in my life”, “Game changer”, “Magical” were just some of the comments. Once cooked there were more “oohs” and “aahs” as the multi layered dessert looked simply incredible. Plated with vanilla ice cream and a buttery crumble, this was dessert perfectly rounded off an entertaining and educational evening. We’d like to thank Graham, Daniel and Juan for generously sharing their skills, and Ros and her team at Cookery School for being brilliantly helpful behind the scenes. Last but certainly not least, a big thanks to all of the food bloggers who came along to make our first Great British Chefs Cook School a night of friendly fun. Watch this space for more details of next school. In the meantime you can download a special e-book of Graham Hornigold’s recipes from Great British Chefs Cook School here.